Ruth Williams, 86, of Maxwell, passed away Saturday, March 16, 2019, at her home near Maxwell. Visitation will be 5-7 p.m. Tuesday, March 19, at Rasmusson Funeral Home (422 First Street) in Maxwell. A funeral service will be 10:30 a.m. Wednesday, March 20 at Loring United Methodist Church near Maxwell. Burial will be at Mt. Zion Cemetery. Ruth was born July 15, 1932, in Colo, the daughter of Harold William and Emma Rosemond (Wax) Bloomberg. She graduated from Nevada High School in 1950 and later that year was united in marriage to Donald Williams on December 15. Ruth started working for Tipton Drug in Nevada while in high school. She then went to work as a telephone operator and spent a couple years at the ASC Office. Ruth also worked for Donnelly’s Marketing and helped Don on the farm. In 1996, she retired from FS to stay home and watch her grandchildren. 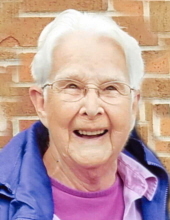 Ruth was an active member of Loring United Methodist Church. She enjoyed gardening, being outside, crafts and had been a cake decorator since 1960. Ruth is survived by her daughter, Kay (Tony) Morris of Maxwell; her grandchildren: Nina Morris and Rease Morris; her sister, Karen Carney of Maxwell along with many nieces and nephews. She was preceded in death by her parents; her husband; her son, Kim Rease Williams; her brother, John Bloomberg; and her sisters: Gertrude Richardson and LaVaughn Hansen. Memorial contributions may be made to the Mt. Zion Cemetery Association in memory of Ruth. To send flowers or a remembrance gift to the family of Ruth Williams, please visit our Tribute Store. "Email Address" would like to share the life celebration of Ruth Williams. Click on the "link" to go to share a favorite memory or leave a condolence message for the family.